Last week, the Department of Water Resources and the Bureau of Reclamation submitted their case in chief for the California Water Fix to the State Water Board in preparation for the upcoming hearing, scheduled to start at the end of July. Unfortunately, I was on the road on that particular day, and so I left detailed instructions at home with my minions on how to work my equipment, which admittedly can be a little tricky, and well, I’ll just say they were technical difficulties; I have only the end of Mark Cowin’s remarks and the questions. Interestingly, there were a number of reporters there but few chose to actually write about it, those being Ryan Sabalow with the Sacramento Bee and Lisa Krieger with the San Jose Mercury News. After the documents were submitted, both Restore the Delta and Californians for Water Security issued statements. So in order to better frame the responses, I have reconstructed the media call from the written notes for DWR attorney Tripp Mezell and Director Mark Cowin; Secretary Laird did not stick to his speaker notes so his remarks can’t be included here. I also covered portions of the question and answer period. Reminder: Opening statements are from their prepared notes, but the questions are from the actual call. Tripp Mezell, senior attorney for the Department of Water Resources, began the media call. “Yesterday, DWR submitted written testimony to the State Water Resources Control Board in advance of the public hearings on a request to add three new points of diversion to the water rights held by DWR for California WaterFix. The State Water Board may have a hearing whenever a permit holder requests a change to a water right. These hearings will typically focus on three legal aspects: 1) injury to legal users of water; 2) whether the change in effect initiates a new water right; and 3) reasonable protection of fish and wildlife through protection of the public trust. The State Water Board hearing for California WaterFix has split these three questions into two parts, with Part I starting on July 26, 2016 and Part II scheduled for 2017. Part I will focus on whether the new points of diversion alter water flows or affect water quality such that there would be an injury to any legal user of the water, and if the addition of three new points of diversion in effect initiates a new water right. Part II will focus on the extent to which fish and wildlife will be affected by the proposed change. Testimony submitted [last week] by DWR is specific to Part I. Then, Director Mark Cowin gave his remarks. “One of the State Water Board’s most critical, ongoing responsibilities is to ensure that all of California’s dams and diversions structures, including those of the SWP and CVP, are operated to avoid injury to other legal users of water and protect fish and wildlife. In operating the SWP and CVP, DWR and USBR have been subject to this authority of the Board for decades. We are now at the point in the extensive planning process for CWF, that we are ready to demonstrate to the SWRCB and all concerned parties that we can operate the SWP and CVP with new screened intakes on the Sacramento River and continue to avoid injury to other legal users of water, and to protect fish and wildlife. CWF has benefited from extensive public comment and review, and these hearings are yet another opportunity for anyone concerned about potential effects to ask questions and get answers. Through hundreds of pages of testimony submitted yesterday in advance of the hearings, DWR & USBR engineers, lawyers and water experts show that Water Fix will not negatively impact flows or water quality such that there would be injury to any legal user of the water. We also show that CWF does not establish a new water right. Aside from the new place of diversion, we would continue to operate the SWP and CVP consistent with our existing water rights. DWR & USBR have completed extensive preliminary engineering, hydrologic and hydrodynamic evaluations, and biological analysis to define the proposed project. We know what it looks like in detail, and have provided tens of thousands of pages of environmental analysis that describe potential effects under a variety of circumstances. The new intakes in the north Delta will allow greater flexibility in operating both north and south Delta diversions. For example, the new diversion will allow us to capture more water during times of heavy rainfall when diversions pose less risk to fish and water quality. By operating the north Delta diversions during these high flow periods, we can avoid creating reverse flow patterns in the Delta that are harmful to fish. Alternatively, during dry seasons we can restrict north Delta diversions and rely more on south Delta pumping to maintain water quality through the Delta. Water Fix will simply change the place where some water is diverted from the Delta. But under any operation, we will continue to meet water quality standards. DWR has a proven track record of meeting the Water Board’s Delta water quality standards 99.9% of the time. In a concurrent process, the Board is also working now to update the requirements in the Bay-Delta Water Quality Control Plan to better protect fish, wildlife, Delta diverters, and the communities that depend upon export of water from the Delta, as well as other beneficial uses. This is a crucial element of the Governor’s Water Action Plan and fundamental to our effort to achieve the co-equal goals of ecosystem health and water supply reliability in the Delta. When the Board establishes new standards, we will meet our obligation under them, just as we have met our obligations under the previous standards for nearly the last four decades. We will meet those standards – whatever they may be – regardless of whether California Water Fix advances. But it will always be easier to achieve the operational objectives of the SWP and CVP and continue to meet standards with the flexibility provided by additional water project intakes. We have competed extensive state-of-the-art modeling to demonstrate how the SWP and CVP would be operated with CWF in place. Over the next several months, we expect there will be much deliberation through the Board’s hearing process over the results of modeling. That deliberation is part of the process and appropriate. Our modeling can estimate how the project will operate during a range of scenarios. However, modeling is theoretical and water projects are managed in real-time. I hope all parties will remember that our track record of meeting standards isn’t based on any given model, but by decisions made by experienced human operators in real time. That human factor allows the projects to stay in compliance with water quality standards nearly all of the time and adapt to future conditions that are clouded by climate change. If we cannot modernize our Delta water conveyance system we will miss opportunities to capture and store water at times of high flow, as we saw this winter. Local water districts will face increasing risk of water shortages. Water Fix is not just a solution for a few isolated water users. It is a solution for California. Let’s not forget that while over 30 percent of the water used by for Southern California residents and businesses comes from the Delta, it’s also the source of up to 40 percent of the water supply for Bay Area cities, businesses and residents. California Water Fix is simply about diverting some of those supplies in a more secure, fish-friendly place in the Delta. Water Fix would provide clean, reliable water to 25 million Californians. It would help protect and restore the Delta ecosystem, and secure the backbone of our state’s fresh water supply in the face of mounting uncertainty. Question: There have been lingering questions on the Water Fix with contractors having some lingering concerns about whether they are going to pay for this, but there isn’t any guarantee about how much water would be delivered. Have you made any progress in addressing those concerns for the contractors south of Delta? Question to Cowin: The opening statement said you were able to meet water quality standards in the Delta all but .1% of the time over the last 50 years or so. I’ve never seen that quantified before. How were you able to arrive at that number? Did you literally go back and count every single standard every day over the last 50 years? “That would obviously include wet years when it’s easier to meet the standards?,” asked the caller. “Do you have idea what that 0.1% number might be if the standards hadn’t been modified frequently over the last few years?” asked the caller. Next question: Given the way climate change is going to play out in California, how is this project going to be able to observe the water rights and the federal environmental requirements and the salinity requirements or precautions to draw much water? “I would just say that this is manmade drought, then you have to know that is false, because it’s only true of Mother Nature is a man,” said Secretary Laird. In a media call and testimony submitted to the State Water Resources Control Board today, the California Department of Water Resources laid out their case for the Delta Tunnels (CA WaterFix). Below is the response from Restore the Delta. “While DWR submitted over 5,000 pages for its case to the Board, they submitted no exhibits addressing why the economic benefits and costs of the Delta Tunnels proposal are in the public interest. This is a huge omission. “It appears likely that the agency has refined its modeling to buttress their existing talking points, such as the alleged benefits of dual conveyance providing flexible response to listed fish for real time operation of diversions. They also continue to claim that water rights holders will not be injured by Tunnels operations, without specifics. “The State Water Resources Control Board specifically asked for testimony on whether this change petition is really a new water right application. DWR’s case-in-chief maintains that an old diversion point in their permits at Hood in the north Delta is “close enough” to the new Tunnels intakes at Clarksburg and Courtland to justify the Board deciding this is a small change in their permits. “Instead, we think Hood is a different location than either Clarksburg or Courtland. Board rules require that water availability analysis is done for new water right applications. And the outcome of this decision could result in the Tunnels getting water rights that are over fifty to seventy years junior to the rest of the State Water Project. “DWR argues that their petition is not a new water right because they claim that several operational aspects of the Tunnels (upstream storage, overall Banks/Jones pumping) will not change materially, this is merely a modification of the existing CVP and SWP permits. You can visit Restore the Delta online at RestoreTheDelta.org. Today Californians for Water Security (CWS) reacted to testimony submitted by the Department of Water Resources (DWR) to the State Water Resources Control Board (Water Board) highlighting the importance of implementing the California WaterFix to improve water quality statewide and protect the Delta ecosystem. CWS is a broad statewide coalition of more than 170 public safety, local government, water, business, labor, environmental, family farmers, taxpayer and others who support the WaterFix as a critical investment in water security and protecting the fragile Delta. WaterFix would create more flexibility to better balance water quality, fish protection, and water supply: WaterFix would allow the state and federal water projects to capture and store water during times of heavy rainfall and runoff, when diversions pose less risk to fish and water quality. Such opportunities are limited now because the location of the existing south Delta pumps are within endangered fish species’ habitat. 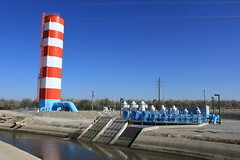 New intakes offer increased flexibility to the State Water Project and Central Valley Project to operate in “dual conveyance” with the existing pumps in the south Delta; this would allow, for example, utilizing northern diversions during seasonal rain events when pumping would otherwise be restricted in the south Delta. This is not a new or expanded water right and protects existing water rights: WaterFix would add new locations on the Sacramento River from which the State Water Project and Central Valley Project may divert water based on existing water rights and no new or expanded water rights are being sought. In addition, DWR and Reclamation do not seek any modifications to the water quality standards upstream or downstream of the proposed diversion points. Those standards, which protect existing water users, must still be met. WaterFix would operate within standards set by the Water Board: DWR has a proven track record of meeting the Water Board’s Delta water quality standards. When the Water Board establishes new standards, DWR will meet its obligations under them, as has been the case for nearly four decades. Meeting the Water Board’s current and future water quality standards would be easier with the flexibility provided by the dual conveyance. WaterFix will be operated in real-time: DWR submitted extensive modeling to estimate how the project will operate during a range of scenarios. However, modeling is theoretical and water projects are managed in real-time. While modeling is the best available tool to perform an assessment of potential water operation effects, water project operators can and do handle far more complexity than models. That human factor allows projects to stay in compliance with water quality standards nearly all of the time and adapt to future conditions that are clouded by climate change. California WaterFix was developed through a10-year collaboration between the State of California, U.S. Bureau of Reclamation, public water agencies, federal and state fishery agencies, non-governmental organizations, agricultural interests, and the public. It is the state’s plan to more efficiently and in a more environmentally protective way capture and move water from the Sacramento-San Joaquin Delta. It is a part of the state’s comprehensive plan to better manage water, which includes enhanced recycling, additional conservation, increased storage and improved groundwater management. WaterFix would reduce the “reverse” flows in south Delta channels that pose risks to threatened and endangered fish species. It is an upgrade to the 50-year-old water system that delivers water to two out of three Californians. CWS is a growing coalition of more than 12,000 California citizens and more than 170 organizations representing business leaders, labor, family farmers, local governments, water experts, environmentalists, public safety officials, infrastructure groups, taxpayer associations, and others who support the plan to fix California’s broken water distribution system. The Governor’s plan was drafted after nearly a decade of scientific review and analysis by leading water experts and conservationists and has received input from leading scientists and engineers. The coalition is waging an active advertising, grassroots lobbying, social media and public advocacy campaign to support this important project to fix our aging water distribution infrastructure and improve water reliability and security throughout the state.